Kuala Lumpur, 11 November 2016 — Today, Ultimate Ears expanded its lineup of multi award-winning mobile speakers in Malaysia with UE MEGABOOM, the next-generation portable wireless speaker that delivers more power, more sound and more bass than you’ve ever experienced before in a portable speaker. UE also introduced UE BOOM 2 and UE ROLL 2, the latest editions to UE’s colorful lineup of beach-, snow- and anywhere-you-go-proof wireless mobile speakers. UE MEGABOOM blasts freakishly amazing 360-degree sound with heart-pounding bass. With a waterproof – IPX7 certified – and stain-resistant acoustic skin, and a durable grab-and-go design, UE MEGABOOM makes your musical adventures both awesome and easy. Plus, UE MEGABOOM weighs less than 900 grams, features a 20-hour rechargeable battery life and 100-foot wireless Bluetooth® range, so you can keep the party going anywhere. Designed to get wet, muddy and beat up, UE BOOM 2 blasts insanely great sound in every direction. The speaker is waterproof (IPX 7), drop-proof (from up to five feet high), and the size of a water bottle, so stick it in your bike’s water bottle holder or clip it to your bag. 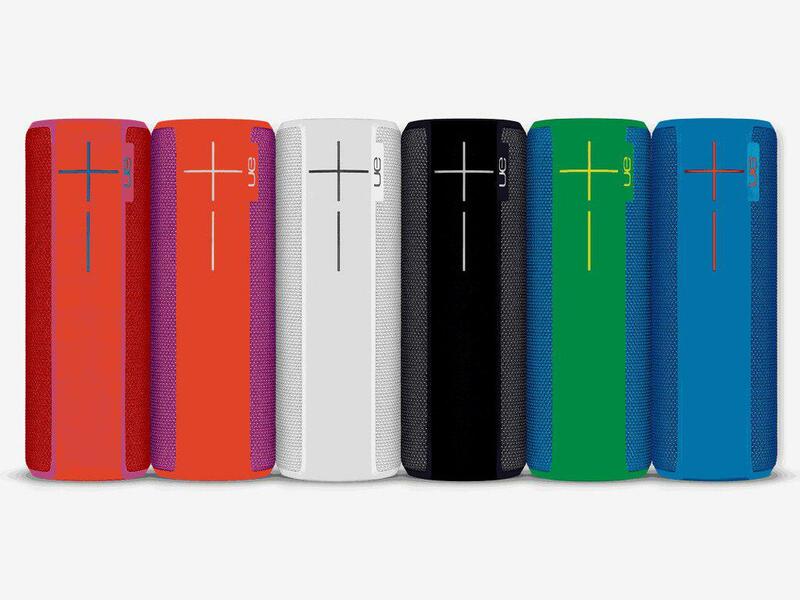 UE BOOM 2 is also 25 percent louder with a longer wireless range of 100-feet and a completely waterproof design. It has a 15-hour all-day, all-night battery life, plus, new and innovative tap control that allows you to skip songs, without needing to have your phone in-hand. Whether at the beach or backpacking, UE ROLL 2 brings even more to the party, with 15 percent more sound and an increased wireless range of 100-feet, all while keeping the sleek, disc shape design of the original UE ROLL. Weighing in at just 230 grams, the UE ROLL 2 packs in more sound without adding extra size or bulk. It is also equipped with a bungee cord loop that can be attached to your backpack, belt loop or bike, so you can take it anywhere and never be without music. It’s waterproof (IPX7 certified), drop-proof and built to withstand a beat up, all while delivering epic sound in the palm of your hand. Ultimate Ears also announced PartyUp, a new app feature that allows you to wirelessly connect more than 50 UE speakers within seconds. With this app, you can wirelessly connect a mix of UE BOOM, UE BOOM 2 and UE MEGABOOM speakers together, allowing you to crank up the music in places where no other sound system can go, sharing music and moments in ways that weren’t previously possible. With a free, over-the-air update to the existing UE BOOM and UE MEGABOOM apps, you can easily see, select, drag and drop available speakers to join the party in just seconds. From Siri and Google Now voice integration to Tap Controls, UE has added a host of additional features, continually unlocking experiences for music fans. UE MEGABOOM, UE BOOM 2 and UE ROLL 2 are now available at all Major Apple Stores, followed by major gadget stores by end of November. UE MEGABOOM goes for a suggested retail price of RM 1,199 / ~US$299 (inclusive of GST), whereas UE BOOM 2 goes for a suggested retail price of RM 929 / ~US$229 (inclusive of GST). UE ROLL 2 goes for a suggested retail price of RM 449 / ~US$109 (inclusive of GST). PartyUp is available through the iOS and Android app stores. This free app enhancement works with UE BOOM, UE BOOM 2 and UE MEGABOOM through the UE BOOM and UE MEGABOOM apps. PartyUp is not available on the original UE ROLL or UE ROLL 2. Speakers are sold separately.